Steam Heat forces hot steam through the filter for dark, rich espresso brew. Frothing Arm makes creamy froth to top off your cappuccinos and lattes. Easy Pour Glass Carafe serves up to 4 shots with just the tilt of the wrist The Drip Catcher is a removable, washable drip tray to collect coffee drips and keep brew space neat and clean. 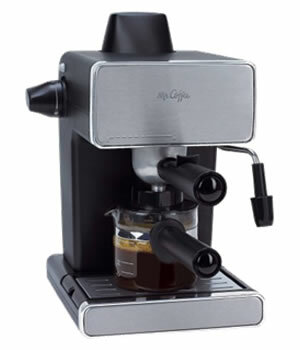 Description: The Mr. Coffee Espresso maker is perfect for the office that like to make traditional Cuban coffee. With a 4 cup carafe and a deep coffee cradle, your Cuban coffee colada will come out perfect every time!